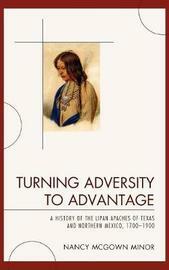 Turning Adversity to Advantage is the story of the Lipan Apaches, who are now one of the forgotten Indian tribes of Texas and northern Mexico, yet they were once one of the largest and most aggressive tribes of the Rio Grande region. They were as much a part of the landscape as mesquite trees or cactus and proved just as deadly to their enemies as the rattlesnakes coiled among the rocks. Modern borderland residents are left with only a few vague rumors of their past presence and even scholars fail to credit the tribe's impact on the history of the region. The historical record is replete with examples of what the Lipans did; now it is time to discover the why. The story of the history of the Lipan Apaches is a tale of survival and preservation in the face of incredible challenges. Time and again, the Lipan Apaches were able to overcome obstacles and turn them to the tribe's advantage. Nancy McGown Minor is an independent historical researcher with a master's degree from Texas State University. She specializes in archival research regarding the history and culture of the Lipan Apaches and is the Tribal Historian of the Lipan Apache Tribe of Texas. Ms. Minor is also the co-author (with William Chebahtah) of Chevato: The Story of the Apache Warrior who Captured Herman Lehmann (University of Nebraska Press, 2007). This work contains the oral history and historical context of the life of Lipan Apache shaman Chevato (1852-1931), one of the founders of the Native American Church. Other works include The Light Gray People: An Ethno-history of the Lipan Apaches of Texas and Northern Mexico (University Press, 2009).